The happy couple had their First Dance as husband and wife outside Fall River Lodge. The couple twirled around a few times and finished with this dip kiss in front of their adoring guests. Before this we had walked across the road and captured some photos in front of an elk with some mountains behind them. 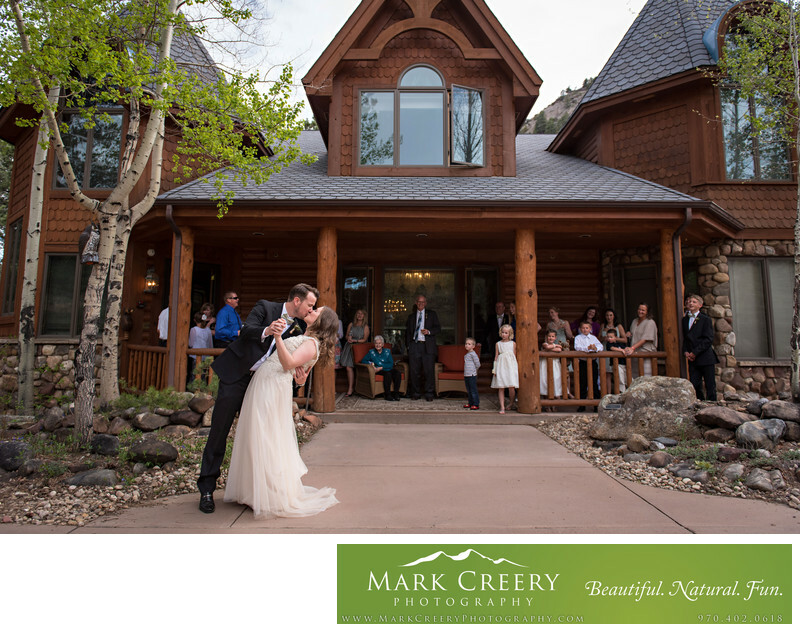 This relatively unknown hidden gem in Estes Park is a superb location for a small wedding, as you can rent the whole place out. With 8 bedrooms it can accommodate most of your guests. The ceremony site is right down by Fall River, with a scenic walk up to the site for the bridal party. Having a river right there to get scenic shots after the ceremony is a big bonus. The dining rooms are intimate and ornately decorated (as is the whole house), so it feels like a stately affair with the laid-back Estes Park vibe still.